A Canine model of intraventricular blood cast was developed in nine adult dogs to study the feasibility and the benefit of Urokinase administration by intraventricular route. A simple ventricular cannulation techniques was described to inject 8cc of preformed autologous clot to develop an intraventricular "blood cast model". An indwelling ventricular catheter-reservoir system was placed for direct administration of Urokinase to induce rapid clot lysis. An experimental intraventricular haemorrhage (IVH) model was developed in nine adult dogs. Urokinase, a thrombolytic agent, was injected into the ventricle of five animals through a catheter-reservoir system described in the earlier part. Four canine models served as a control. The dosage determination and the methodology of instillation of urokinase were described. Following this the animals were observed for any bleeding disorder and the neurologic status. Dissolution of the clot was demonstratedin the urokinase treated dogs by serial clinical examination, Ventriculography and post mortem studies. Absence of side effects with this mode of administration was emphasised. Eighty five patients with histopathologically confirmed intracranial metastatic lesions were analysed retrospectively. There were 55 males and 30 females. More than half of the patients were in fourth and fifth decades. Headache (69 percent), vomiting (50 percent) and altered sensorium (46 percent) were the common presenting features. Failing vision and epileptic seizures were present in 18 percent and 15 percent of the cases, respectively. Papilloedema was present in 68 percent of patients. Motor weakness and cranial nerve involvement was found in 42 percent and 22 percent of the patients, respectively. In 87 percent of the cases the lesions were located within the cerebral hemispheres. Only 6 percent of the patients had lesions in the cerebellum. Carcinoma of the lung was responsible for 36 percent of all intracranial metastases, followed by malignancy of the gastrointestinal tract (15 percent), genito-urinary tract (7 percent) and breast (6 percent). The primary lesion could not be located in 19 percent of the cases. 80 percent patients underwent surgery and less than half of those received postoperative irradiation and chemotherapy. The immediate postoperative mortality was 21 percent. The overall survival at five years was 6 percent. The possibility of oxygen radical-induced injury contributing to the pathogenesis of muscle disorders was studied. Significant increases in fluorescent lipid peroxidation products was found in the muscle samples of myotonic dystrophy (MyD) patients as compared to controls as well as patients with Duchenne Muscular dystrophy (DMD), Amyotrophic Lateral Sclerosis (ALS), Polymyositis and Limb Girdle Dystrophy (LGD). The results demonstrate the possibility that in MyD the primary genetic disorder leads to the rapid generation of oxygen radicals, tissue depletion of antioxidants followed by peroxidation of membrane lipids, impaired calcium homeostasis and finally atrophy of the muscle. Prostaglandins (Pgs), especially PGE2 and F2( ( have been implicated in variety of pathological processes including proteolysis of normal and dystrophic muscle. Using a modified radioimmunoassay which did not involve extraction in organic solvents and purification, thus eliminating acid artifacts, we measured PGE2 and F2( levels in patients with myotonic (MyD), Duchenne (DMD), and limb girdle (LGD) dystrophies and amyotrophic lateral sclerosis (ALS). There was a significant increase in PGE2 and PGF2 in the muscle samples of all the disorders studied as compared to normal controls. It is proposed that increased influx of calcium activated phospholipase A2 (PLA2) leading to the accumulation of arachidonic acid and hence prostaglandins. It appears that the relative increases in PGE2 and PGF2( which are implicated in protein degradation and synthesis respectively in vitro, may reflect the extent of degeneration and regeneration occurring in the diseased muscles. Clinical data of 132 patients of polymyositis seen over a period of ten years was retrospectively analysed. Important features included a mean age of 32.31 years with a range of 8 years to 70 years. 40.62 percent patients were of primary idiopathic polymyositis while 53.13 percent presented with disease of more than six months duration. Pelvic girdle weakness was demonstrated in 31 cases (96.87 percent). Creatin phosphokinase (CPK) values were consistently elevated in 81.25 percent of these cases. Electromyography in majority showed mixed neurogenic and myopathic pattern. Muscle biopsy was performed in 23 patients and all revealed changes characteristic of polymyositis. Follow up was available in 18 cases. The prognosis of twenty consecutive patients with acute spontaneous putaminal haemorrhage was studied using clinical and CT scan findings. 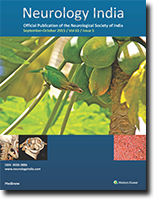 Patients with haemorrhage of less than 4.5 cms were mostly conscious and had independent activity of daily living (ADL) at the end of 3 months; between 4.6 cms and 6 cms., they were mostly drowsy and had partly independent ADL; above 6 cms., they were in stupor or in coma with a high incidence of mortality. Early surgical intervention is advised in the last group. Intraventricular neurocytomas are rare or have been earlier misdiagnosed as Oligodendroglioma, a tumour which they closely resemble at light microscopy. Three such intraventricular tumours are described, all of which were diagnosed as Oligodendroglioma on CT scan and at routine light microscopy. The judicious use of EM for a definite diagnosis of these tumours is emphasised. Cells with multiple processes, abundant RER and dense core vesicles and profiles of axon terminals with groups of synaptic vesicles, clinches the diagnosis. Even though the prognosis of neurocytomas is generally believed to be good, it may depend on whether they have only neuronal or associated Glial differentiation. An 18 year old male who consumed food cooked in contaminated cooking oil, during an epidemic at Calcutta in 1988, developed Tri-O-Cresyl Phosphate toxicity and peripheral neuropathy. Pathological study revealed focal loss of large myelinated fibres.EM study showed accumulation of agranular reticulum in relatively preserved axons and axonal and myelin vacuolation and accumulation of dark bodies and granular transformation of axoplasm in more affected axons, similar to those described in experimentalanimals. A case of alexia without agraphia with CT demonstration of the lesion is reported. The various types of occipital alexia and their anatomic bases have been reviewed. An unusual epidural abscess in a healthy adult is reported. The obvious cause of infection was undetermined. Patient was successfully treated and remained well thereafter.